In the 1930’s, forensic science had not really caught on yet with the Shanghai police force. However, Song Donglu is no ordinary copper. As an assistant prison warden, his interest in criminal psychology spurred him to challenge many convictions. To be proactive, or to spare themselves further embarrassment, his superiors have transferred him into the field to help the Shanghai police get it right the first time. He will be initiated with a particularly sinister case in Lo Chi-leung’s The Bullet Vanishes (trailer here), which opens this Friday in New York. There has been a shooting at the local bullet factory—several actually. It might be a testament to their craftsmanship, except the bullets in question seem to disappear upon entry. Many of the workers believe it is really the curse of a worker unjustly accused of stealing product. The autonomous factory owner dealt with the case per their traditional method: a friendly game of Russian roulette. When those who wronged the woman start turning up dead, the other workers get a bit spooked, setting production even further behind. Song does not believe in ghosts. He is a man of science. Still, he has some rather mysterious circumstances on his hands, like corpses with gunshot wounds but no discernible bullets to analyze. Before long, he will also have to wrap his head around a classic locked room murder. At least his new partner Guo Zhui has his back. They can’t say the same for their superior officers. Though there are a lot of familiar Holmsian elements in Bullet, Lo and co-writer Yeung Sin-ling consistently give them with a fresh spin. Perhaps most intriguing is Song’s ambiguous relationship with a convicted black widow murderess (played by a glammed down but terrific Jiang Yiyan), who could either be his Irene Adler or Hannibal Lecter. Determining which could be fertile ground for a sequel. In fact, Bullet is pretty unusual for a big screen murder mystery, because it values atmosphere and procedural process (as antiquated as it might be by our standards) over formulaic chases and phony suspense. Viewers might have a general sense where it is headed, but at least the film makes an effort to hold onto its secrets. There are still several well mounted period action sequences sprinkled throughout the film, but the overall vibe of Bullet is refreshingly cerebral. With Song, Lau Ching-wan brings to life a great character. Yes, he is a bit socially awkward at times, but the detective is his own man, far more compassionate than Holmes ever was, particularly in his scenes with the mariticidal inmate. As the more action-oriented Gui, Nicholas Tse is in his element, also developing some nice romantic chemistry with Mi Yang’s Little Lark, the fortune teller. Together as cops with contrasting styles, Lau and Tse have an appealing give-and-take rapport going on. As for Boss Ding, the primary villain and focus of viewer scorn, Liu Kai-chi certainly is not shy chewing the scenery, vaguely suggesting elements of both the psycho and comedic Joe Pesci. That is not a bad thing. From Chan Chi-ying’s stylish noir cinematography to Stanly Cheung’s natty 1930’s-era costumes, Bullet is a great looking film. It is also smart and old-fashioned in a good way. 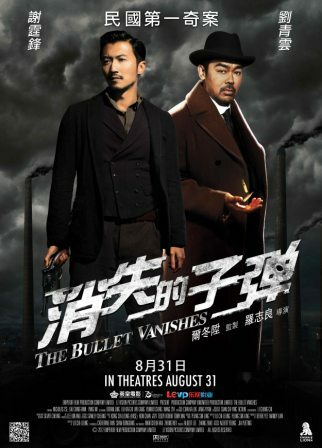 Recommended with enthusiasm for mainstream mystery fans, The Bullet Vanishes opens tomorrow (8/31) in New York at the AMC Empire and Village 7, as well as in San Francisco at the AMC Cupertino and Metreon, courtesy of China Lion Entertainment.